British forces in Iraq are examining the events that led to the deaths of at least five protesters in the southern city of Amarah. Iraqi police and British troops, who control the region, shot at demonstrators when their protest about job shortages turned violent. Some of the crowd were armed with grenades and stones. Order has now been restored in the Shia Muslim town, which has seen much less unrest than Sunni areas around Baghdad. The BBC's Alastair Leithead, in Baghdad, says the investigation is focusing on who fired the first shot, and the chain of events that led to the deaths. 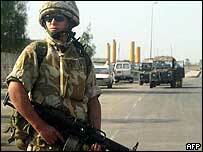 UK military officials said at least one man was shot dead by a British soldier as he was about to throw a grenade. Earlier, US soldiers shot and killed two Iraqi police officers after intervening in an apparent family feud in the northern city of Kirkuk. Witnesses in Amarah said the crowd had been demonstrating against the recently elected governor and the lack of jobs in the region. They began throwing stones and explosive devices at the Iraqi police who shot at protesters, killing four, reports said. But one witness said that it was not clear whether it was Iraqi police or protesters who began firing first. British soldiers moved in to try to restore order and also opened fire. Coalition officials said one man was shot by a British soldier as he tried to throw a grenade and another man - also armed with grenades - was injured. The hospital in Amarah said six people had been killed and 11 injured. On Tuesday, four Iraqi army veterans were wounded in the main southern city of Basra when police opened fire during a demonstration about unpaid stipends. 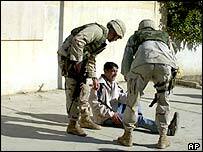 In Kirkuk, the US military said the Iraqi policemen who were killed there did not identify themselves to an American patrol, despite repeated requests and the firing of warning shots. Soldiers from the 173rd Airborne Brigade had been sent to the Rahima neighbourhood to respond to reports on Friday that two families were fighting. When they arrived, they saw two men firing at a house, the military said, and as they approached the two tried to flee. "The soldiers pursued them, shouting and firing warning shots, but the men did not respond. They killed one outright and another died before reaching hospital," said a spokeswoman. Last month, three Iraqi policemen were killed and two wounded in Kirkuk when US soldiers mistook them for bandits. "The coalition is trying to determine why this demonstration got so badly out of hand"